April Reading and ELA Unit . 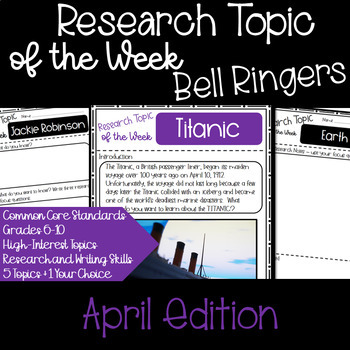 This bell ringer resource includes five high interest topics for students to research daily. Each daily activity only lasts 5-10 minutes. Every week, the students will generate focus questions, research a topic, write a paragraph, and complete a works cited. A rubric and citation cheat sheet are also included. •Just go to your My Purchases page (you may need to login). Beside each purchase you'll see a Provide Feedback button. Click it and you will be taken to a page where you can give a quick rating and leave a short comment for the product. Each time you give feedback, TPT gives you feedback credits that you can use to lower the cost of your future purchases. I appreciate your feedback greatly as it helps me to determine which products are most valuable to you and your classroom. •Look for the green star next to my store logo and click it to become a follower. You will now get the inside scoop on how to Rock Your Classroom!